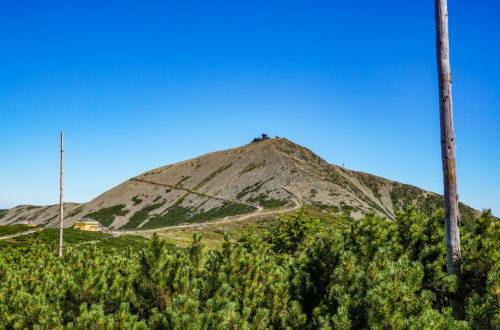 Imagine walking on the level of the high trees, observe the birds and squirrels almost eye to eye and climb to the level from which you can see the tops of the Alps. 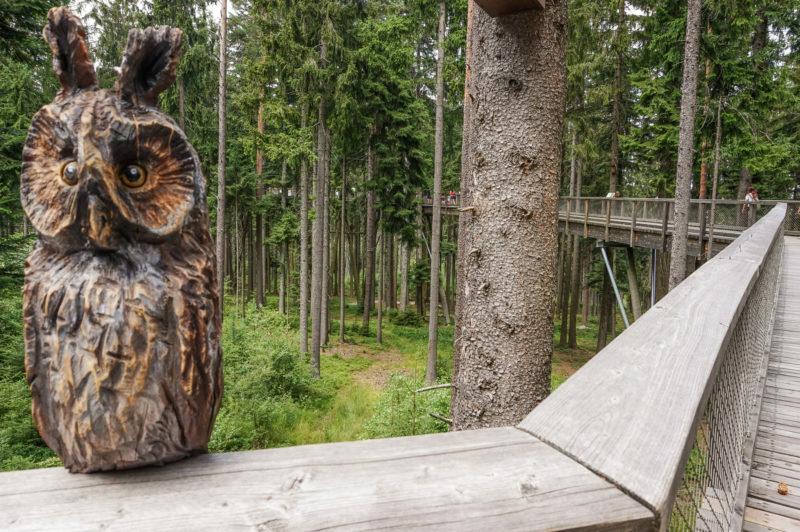 Furthermore, the location is amazing, just on the borders of the lake resort Lipno and Šumava national park, that are both attractive destinations for a summer holiday. 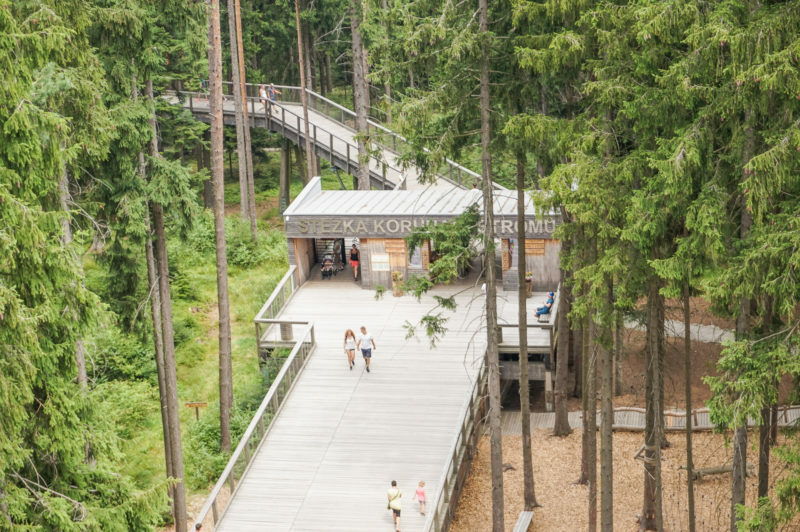 Since it’s quite far away from Prague, we decided to connect this treetop walk visit with our Šumava road trip. 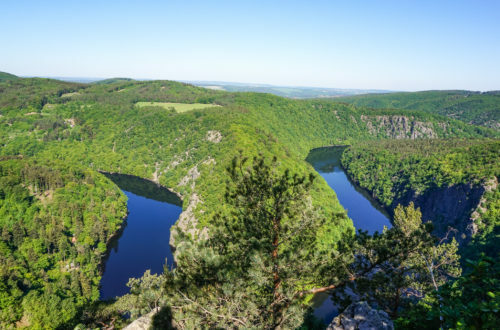 I visited Lipno lake resort for the first time and I was amazed by the biggest water reservoir in the Czech Republic. What impressed me especially was the harbor and boats sailing on the lake. We decided to have a walk through the forest, where is the treetop walk well hidden, so I didn’t see it until the very last moment. The bigger the surprise was, how huge it is. After a few minutes of admiration, I literally skip to the casa, because I want to explore it by myself as soon as possible. Firstly, we enjoyed a gradual climb at the level of the trees. 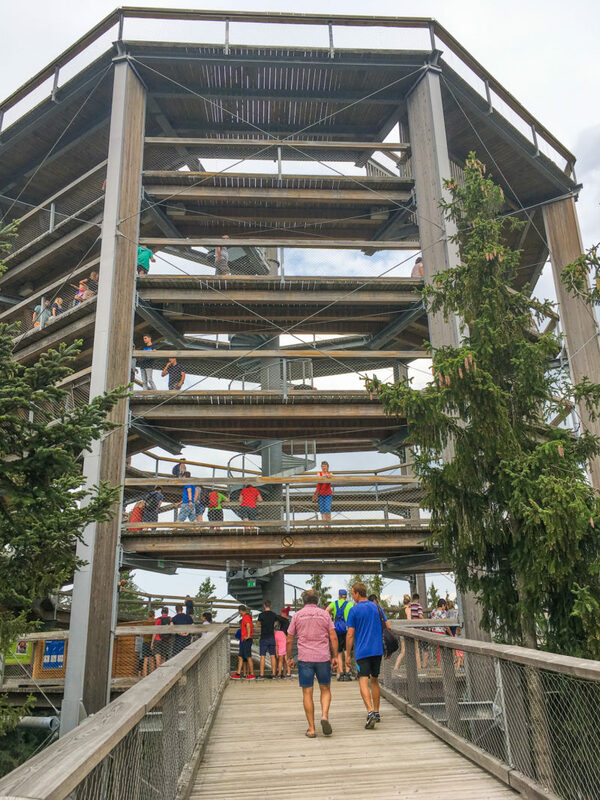 Then we reached the observation tower and my adrenalin was raising. I had a bit of fear of the high, especially with the coming storm, that we can see in the distance. But I just had to do it. The whole construction promised a great view. I must admit, my expectations were very well satisfied. We can see the whole Šumava national park with a bit of the Alps in distance, but the coming storm was impressive as well! 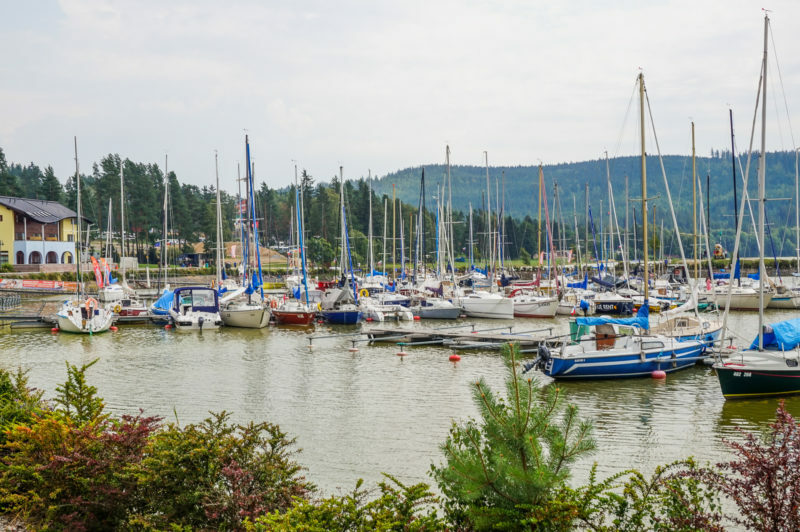 The obvious stop is the city Lipno, where you can find several parking lots. 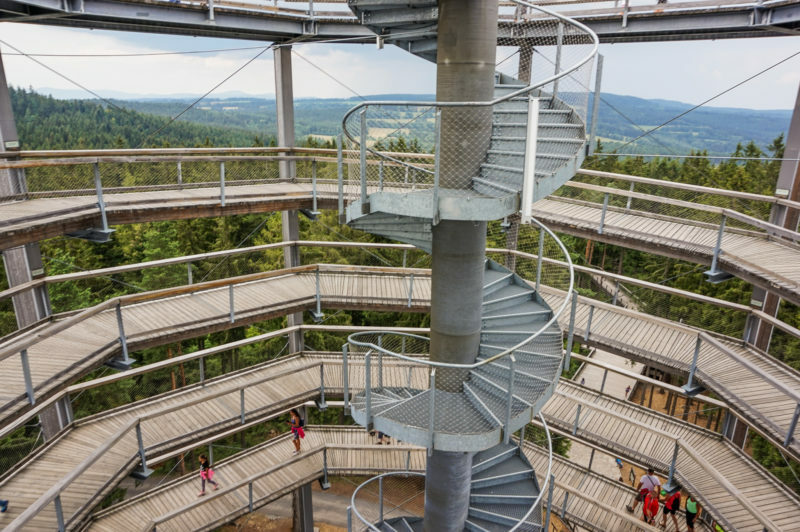 The biggest one is located just under the cableway that will take you to the treetop walk in 10 minutes. The access is completely secured also for strollers, so take your babies with you. We decided to have a short walk, about 1km long with a bit steeper climbing through the forest. On the way back, we decided to enjoy a bit of adrenalin, so we hired scooters down the hill, back to the Lipno. 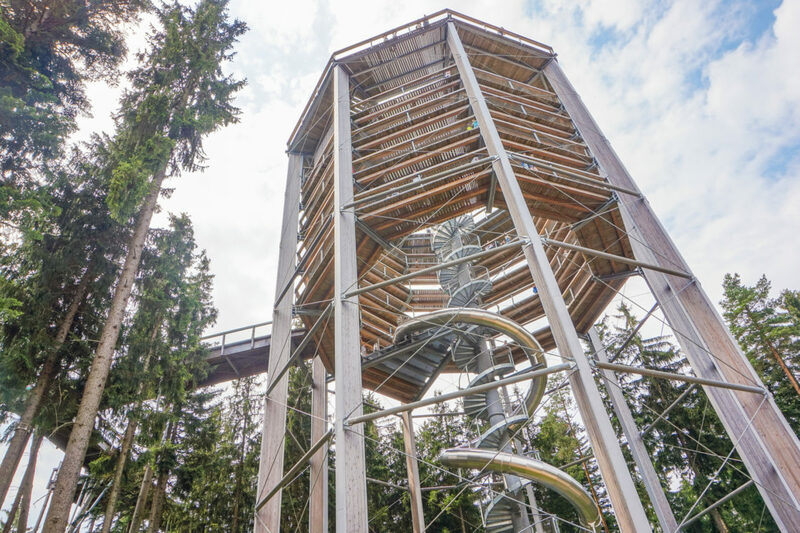 What is great, the treetop walk is open during the whole year, except 24.12. Furthermore, every Tuesday during the summer, you can enjoy a cultural program with live music until 9 pm! 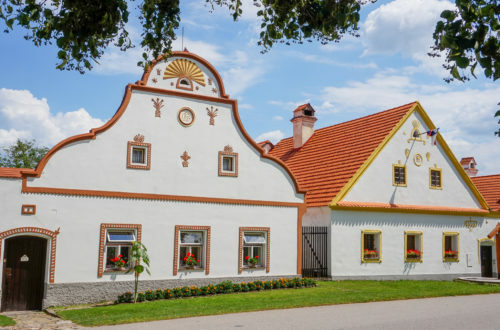 If you are visiting South of Bohemia, I would definitely recommend you stop by this place.